Can you believe this year was over? thought I would share my thoughts with you. Post your years in books in the comments! which is super sad. I blame my dissertation. I love that you can even inject sarcasm into your Goodreads Year in Books. If it makes you feel any better, my average rating was high too. I almost always round up on Goodreads (I REALLY wish they'd add half stars), but still ... oh well, I'm over it. Here's my 2016 Wrap-Up (which also has a link to my Goodreads Year in books at the end). Haha, thank you. It's my special talent. ;) I round up too, maybe that's it. 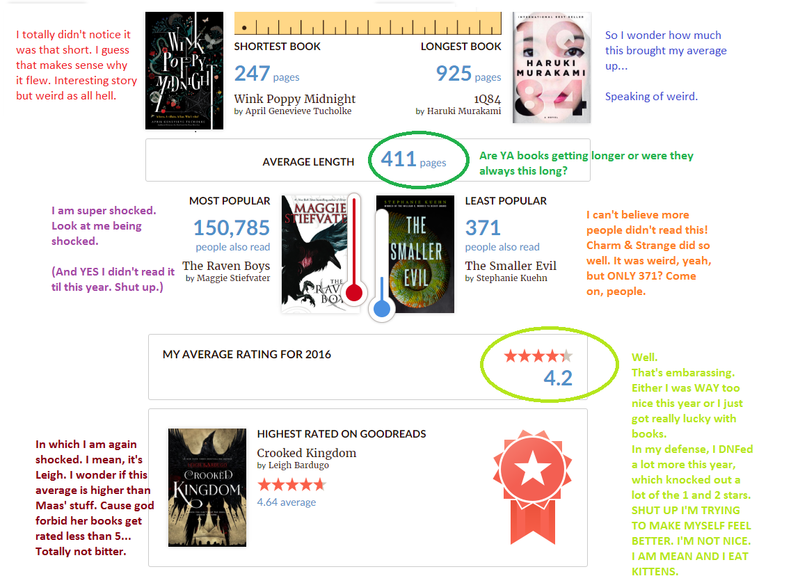 I also realized there were like 10 books I hadn't rated at all so it came down a little. Aw, thanks! Tucholke's writing is so good. I jut haven't connected super hard with her stories. I think I've definitely gotten pickier too. I used to force my way through bad books but now I just move on.